The fungal contribution to the soil community is usually seen as some aspect of their involvement in biomass recycling (releasing nutrients for plants), or direct involvement as components of food webs (as part of the nutrition of some animal, large or small). These aspects of fungal biology are undeniably extremely important and will be discussed in some detail in later Chapters in this book. Here we will only mention these points because we want to emphasise something that usually gets much less attention, which is the fungal involvement in the geological transformations that produce and modify soils (Gadd, 2016, 2017; Robson, 2017) and recovery of high-value rare earth elements or other precious metals from wastes (Boczonádi et al., 2019). and metal–fungal interactions (Robson, 2017; and see Fig. 2). Many of these processes are relevant to the potential use of fungi in environmental biotechnology such as bioremediation (Burford et al., 2003; Conceição et al., 2019 ; Gadd, 2004, 2007, 2016, 2017; Robson, 2017) and recovery of high-value rare earth elements or other precious metals from wastes (Boczonádi et al., 2019). Fig. 2. 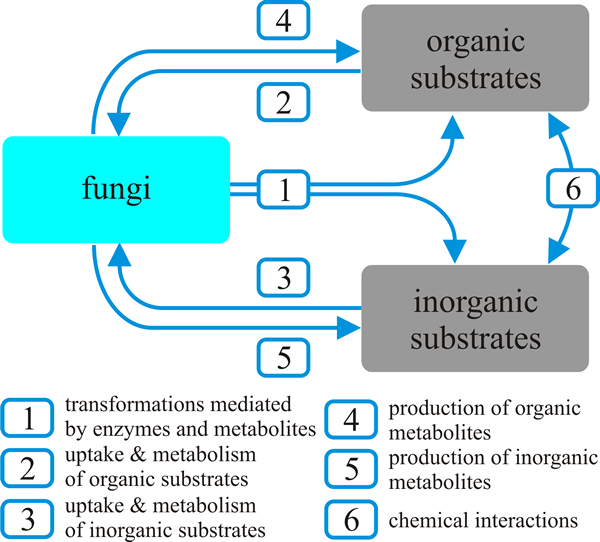 Diagrammatic representation of fungal action on organic and inorganic substrates which may be naturally-occurring and/or man-made. Full key: 1, organic and inorganic transformations mediated by enzymes and metabolites, e.g. H-ions, carbon dioxide, and organic acids, and physico-chemical changes occurring as a result of metabolism; 2, uptake, metabolism or degradation of organic substrates; 3, uptake, accumulation, sorption, metabolism of inorganic substrates; 4, production of organic metabolites, exopolymers, and biomass; 5, production of inorganic metabolites, secondary minerals and transformed metal(loid)s; 6, chemical interactions between organic and inorganic substances, e.g. complexation and chelation, which can modify bioavailability, toxicity and mobility. Organisms in this model may also translocate nutrients. Redrawn and modified from Gadd, 2004; and see Gadd, 2016, 2017. Fungi also affect the physical structure of soils at a variety of spatial scales via electrostatic charge, and adhesive and enmeshment mechanisms. They also produce large quantities of extracellular polysaccharides and hydrophobic compounds that affect water infiltration properties of soils. Fungal decomposition of organic matter can also destroy soil structure through effects on soil aggregation. In turn, soil structure affects fungi. The filamentous growth form of fungi is an efficient adaptation for life in a heterogeneous environment like soil, but the labyrinthine pore network will itself determine how fungal mycelia can grow through and function within the soil (Fig. 3.). Fig. 3. Fungal mycelia visualised in the soil environment. A, Unidentified hyphae bridging roots of Plantago lanceolata growing in non-sterile field soil. Note the shiny films of mucilage; image width = 2 cm. B, Hyphae of Fusarium oxysporum f. sp. raphani colonising a pair of adjacent soil aggregates. Aggregate on left is sterile, hence extensive mycelial development. Aggregate on right is non-sterile; reduced mycelial growth is due to competition from other micro-organisms and reduced nutrients; image width = 1 cm. C, Unidentified mycelium growing in soil pore, visualised in a thin-section of undisturbed pasture soil with a fluorescent stain. Note proliferation of hyphae on pore wall in left of image. Bright spherical objects are sporangia; image width = 150 μm. D, Mycelium of Rhizoctonia solani growing in sterilised arable soil, visualised in thin-section with a fluorescent stain; image width = 150 μm. Modified from Ritz & Young, 2004 using images kindly supplied by Prof. Karl Ritz, Cranfield University, UK. The distribution of water within soils plays a crucial role in governing fungal development and activity, as does the spatial distribution of nutrient resources (Ritz & Young, 2004). In aerobic environments fungi are of great importance on rock surfaces, in soil and at the plant root–soil interface (Table 2 CLICK HERE to see the table in a separate window). Many fungi can grow oligotrophically, which means they can thrive in environments that are low in food resources. They do this by scavenging nutrients from the air and rainwater and this ability enables them to survive on stone and rock surfaces. Fungi are able to cause weathering of a wide range of rocks. In Iceland and other subpolar regions bioweathering of basalt outcrops by fungal communities is believed to be chronologically the first weathering process. Lichens are important at early stages of rock colonisation and mineral soil formation, while free-living fungi are also major biodeterioration agents of stone, wood, plaster, cement and other building materials. There is increasing evidence that fungi are important components of rock-inhabiting microbial communities with significant roles in mineral dissolution and secondary mineral formation. Several fungi can dissolve minerals and mobilise metals more efficiently than bacteria. 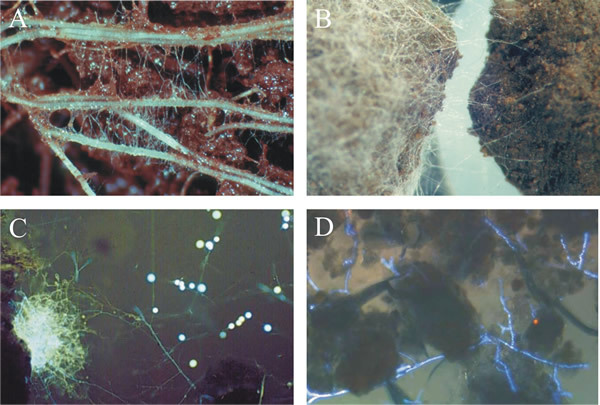 Mycorrhizal fungi are involved in mineral transformations and redistributions of inorganic nutrients (e.g. essential metal ions and phosphate; Figs 4-6). Proteomics analysis has demonstrated that bioweathering of black slate, which can contain up to 20% organic carbon, was caused by the laccase enzymes of the white rot basidiomycete fungus, Schizophyllum commune (Kirtzel et al., 2017, 2018). Fig. 4. 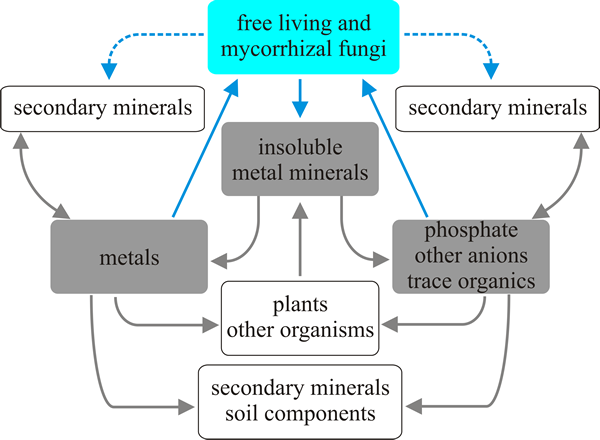 Action of free-living and mycorrhizal fungi on insoluble metal minerals in the terrestrial environment resulting in release of mineral components - metal(s), anionic substances, trace organics and other impurities. These can be taken up by living organisms (biota) as well as forming secondary minerals with soil components or fungal metabolites and/or biomass. Released minerals can also be absorbed or adsorbed or otherwise removed by organic and inorganic soil components. The dashed arrows imply secondary mineral formation as a result of secreted metabolites as well as fungal action on non-biogenic minerals. Possible losses to groundwater are not shown. Blue arrows indicate processes driven by the fungi. Modified from Gadd, 2004; and see Gadd, 2016, 2017. These roles of fungi in soil geochemistry, especially metal cycling, have been included under the term ‘geomycology’, defined as ‘the study of the role fungi have played and are playing in fundamental geological processes’ (Burford et al., 2003; Gadd, 2004, 2007, 2016, 2017). Fig. 5 (above). 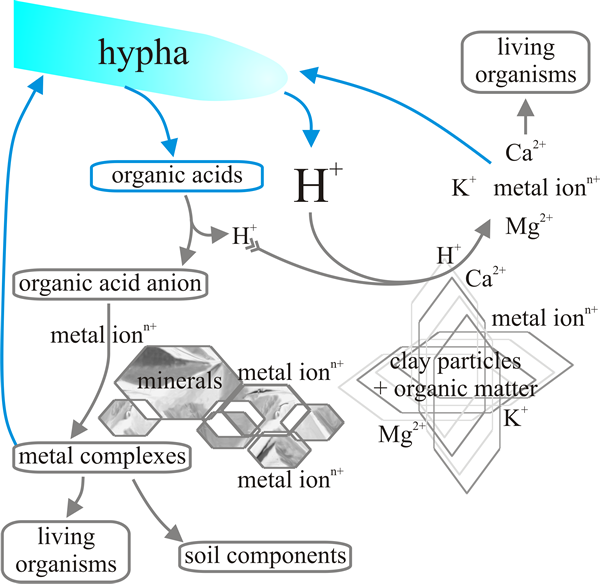 Proton- and organic acid-mediated dissolution of metals from soil components and minerals. Proton release from the hypha results in cation exchange with metal ions on clay particles, colloids etc. and metal displacement from mineral surfaces. Released metals can interact with biomass, can be taken up by other organisms, and can react with other environmental components. Organic acid anions, e.g. citrate, may cause mineral dissolution or removal by complex formation. Metal complexes can interact with live organisms as well as environmental constituents: in some circumstances complex formation may be followed by crystallisation, e.g. metal oxalate formation. Blue arrows indicate processes driven by the fungi. Modified from Gadd, 2004, 2016, 2017. Fig. 6. 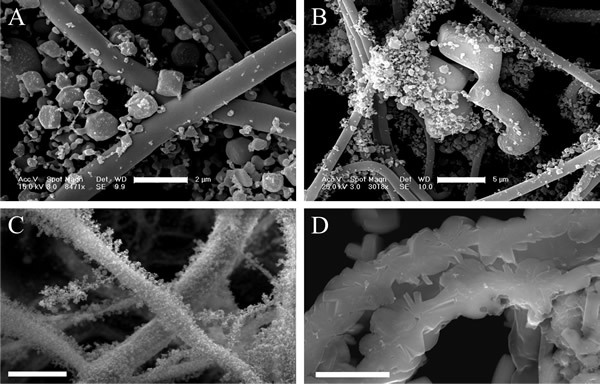 Photomicrographs of fungal hyphae showing examples of minerals formed by hyphal growth; in these cases formation of uranium-containing biominerals following growth on medium containing uranium salts or uranium ore. Scale bars: A,2 μm; B, 5 μm; C, 20 μm; D, 5 μm. Modified from Gadd, 2007 using graphic files kindly supplied by Prof. G. M. Gadd, University of Dundee, UK. See Gadd, 2016, 2017.